Scriptures describe twenty topmost amazing and intimate ways to express your devotion, dependence and attachment to your Priya Thakurji, i.e. beloved transcendental murti form of Bhagavan Shri Krishna. Of Shri Rupa Goswamipada’s sixty-four limbs of bhakti-sadhana, ten forms of bhakti (#23-42) directly involve Shri Thakurji and His worshipers - us! 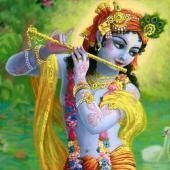 Upon reading this description you will discover that our beautiful, sweet, charming and playful master, Shri Krishna, not only likes formal worship, but Shyama also likes the wild frantic dancing of His bhaktas. The term Shri-Thakurji means one’s favorite and beloved murti or Deity of Shri Krishna i.e. Bankebihari, Radha-Vallabha, Radha-Shyama or Radharamana. By citing Shrimad Bhagavatam and other Puranas, Shri Rupa Goswamipada reveals twenty different ways to please and personally interact with Radha and Krishna in their most beautiful, merciful, and accessible transcendental forms. After listing each item, Shri Rupa mentions the benefits attained by these loving exchanges with Bhagavan Shri Krishna. Their sources from Bhakti-rasamrta-sindhu are in brackets. By engaging in these ways with Shri Thakurji, you will: conquer maya, and become free from disease, sin and rebirth (1.2.125-6, 129); attain liberation to Vaikuntha (1.2.139); and fulfil all your desires (1.2.165).